Friesens Corporation is pleased to announce the purchase of its first LED pres. The press is a 40″ 4/4 perfector press from Manroland. We have a long-standing relationship with Manroland and had before this purchased a 73″ 4/4 press which was installed in 2015. This new LED comes with all the goodies including direct drive plate counting, colour pilot, and auto register to name a few. 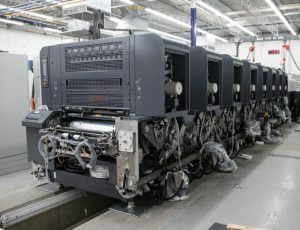 However, the biggest news for our customers is that it will be prepped to run LED inks. LED is the evolution of UV printing without some of the negative attributes of conventional UV. Friesens has printed with conventional inks on its sheetfed presses since its beginnings in the printing business. Conventional ink has many advantages. It is cost-effective, can print on multiple substrates, is pumpable in large totes, stays open, dries well on most stocks, and has a lot of suppliers in its market space. The Advantage of the LED inks includes immediate drying on all substrates, less power consumption than conventional UV, minimal or no set off powder required, elimination of chemical ghosting, no need to varnish the sheet for protection, and the ability to bring sheets directly into the bindery for finishing after printing. But all of this comes at a cost. 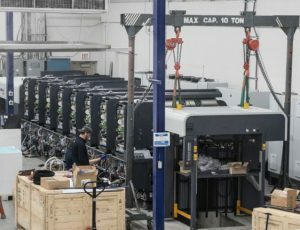 A few examples are inks which are double the cost of conventional inks, tighter operating windows on press, and washes/rollers that carry a 20-30 percent premium. The press arrived at the end of March, the installation has begun, with a May to-live date.